This stuff is Free / Coolware, send me something cool (via e-mail) if you wish! There are a LOT of actions to download at Action XChange site! Note! it seems that when using image sizes like 512 X 512 or 1024 X 1024 pixels, the results are ALMOST instantly tileable. Ok, Rocky's here. (He's Rusty's brother) Rocky 1-6 create random mineral textures based on your FG & BG colors. There's also an action that simulates marble / granite. These are a under construction still... If i get the time and required enthusiasm i will enhance these a bit. Enjoy, and send me some renders if you use these! Here are some rusty actions... Again, the name is self explanatory. Rust01 needs a mask (Flat B/W image) for the rust areas. There will be rust where there's black in the image. You can choose the colors from which the random rust texture is generated. You can also add some bleed by running the bleed actions. Rust02 - 05 create random rust textures based on your FG & BG colors. Enjoy, and send me some renders if you use these! Sorry - these don't tile because of the smoothing methods i used. This one is on beta stage, but take a peek... creates tileable textures for houses. The Ultimate Texture Generator stuff released: Click on the logo for more! 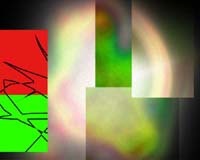 From left: green & red that were used as FG & BG colors, black stroke on the selection. Different layers supplied by Selection nebula. The World's Shortest "How To?" Create a selection in Photoshop, select your colors and run SelectionNebula action for custom Nebulae & Spiral Galaxies. Click on the picture for more info & User Guide! 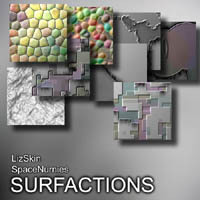 The images in Surfactions graphic are all made with default settings. 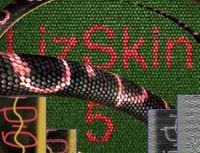 Here's a tutorial how LizSkin was made. As a bonus there's also Surf, which looks kinda coolio, i've used it for example as a bump map for glass. The actions run automatically by default, but you can change the parameters by activating the value tabs in actions palette. Here's an example of one of the surfaces. Automatically created maps from top left: Demo layer, Bump map layer, Diffuse/specular layer, Color layer. The bottom half is a bit better, yet still photoshop - generated surface demo. If you wanna see what they're all about check out "They could be friendly..." in which i've used a pre -version of them. Just click on the pic to see the rest of the gallery! Need I say more? User defined colors for paint & rust areas. Titanic 4 needs a user drawn flat B/W image before it's run. If you want windows, run windows primer first, then T4, then windows poster. All these are included in Surfactions. The actions create the effect depending on the luminosity of the pic. Flares will appear where there's 100% white. You can run the actions to a folder of images, please refer Photoshop's Help file > Playing actions > Batch processing. Here's the actions in action (hehe), a space ship with upcoming SpaceNurnies_DLX_2 surface. Note! Make safeties of your images! The flare actions will render a full white frame if there's no 100% white in the image. Some of the actions try to darken blue skies. Some Reduce the saturation, some reduce the saturation depending on the luminosity etc. I will not go into details, as I've noticed it really depends on the footage, not the method, which works best. So just experiment! 8 different ways to f**k up your footage! Add some REAL realizm to your ah_so_clean renders... Select a video format and hit the play button. The results vary from "subtle" to "less subtle". Again - run the actions - it's a lot better explanation than words could ever be. These actions change your RGB images to CMYK, blur the colors, and revert back to RGB. The results look a bit dream-like, similar to hand colored B/W. Ok. 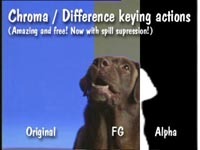 The name says it all... these actions help you extract mattes from chroma keyed footage. And even from footage without blue/green screen BG! They create the masks to the alpha channel, thus converting your 24 bit images to 32 bit. Load one frame of your chroma key footage. As the name suggests, this action also reduces the spill of backing color on the foreground. This one is meant to be used in conjunction with the Difference keyer. Load a frame of your footage, one where the foreground subject is not visible. Make sure it's the active image. NOTE! This action deletes the RGB channels - use copies of the footage, not originals! Regard these actions as PRESETS - you can tweak all the parameters by changing the values in the actions! The Anti-Aliaser is a set of two simple Photoshop actions. The below images are scaled 200% to show the results better. Here's what are the results of Anti-Aliaser "Faster" and "Better" look like, respectively. It's simple. It first upscales the image, then applies median filtering to it, and then downscales it again. The difference between faster and better is that faster upscales to 200%, and better to 400%. That's it in all it's simplicity. I'm also interested on any comments on these & on the site!